For a controlled germination process of the seeds, special priming columns have been developed. The priming columns are configured and build in close consultation with the users. This consultation will take place with the researcher among others, to determine the correct configuration. It ensures they comply with the specific demands and requierements of the priming process. A detailled user guide is included. 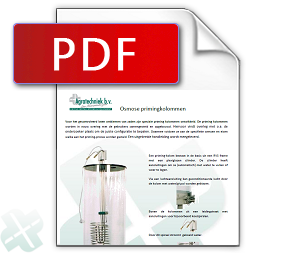 A priming column basically consists of a stainless steel frame with an plexiglass cylinder. The cylinder has connections to be able to fill them with water (automatically) and empty them again. Through an air connection, the conditioned air can be blown through the column with water/glycol. Above the columns there is a conduit street with connections for the cooling coils, for instance. Cooled water flows through this coil. In combination with an electrical heating element, the water temperature in the column is controlled exactly. Besides the water temperature, the seeds can also be illuminated to have the germination process take place. For more illumination, lighting fixtures can be installed on the conduit street. This light can also be configured as desired per stage. Usually a lot of day light (color 840 in TL) is used. The entire priming process is controlled automatically with the ABC processor. The operation occurs by means of a touchscreen. One ABC processor/touchscreen can operate several priming columns. It is possible to configure the temperature with the ABC processor. A day and night rhythm can be configured and saved as pre-set. The menu can be called up again easily. All settings and measurement values can be saved to your pc using the ABC PC Program. These values can be called up again in a graphic or table for analysis. This makes it possible to, if needed or desired, have a tailored adjustment of the processes (Pre-sets). Furthermore there is an SMS Module to send an sms in case of emergencies, and a MCM Module for operation and monitoring (including graphics) from your smartphone or tablet. The ABC guard thermostats will intervene when the temperature of the water becomes too high or too high. All equipment will be shut down to prevent damage, followed by an alarm. After the alarm, an sms message with detailled information can be send to the responsible persons.